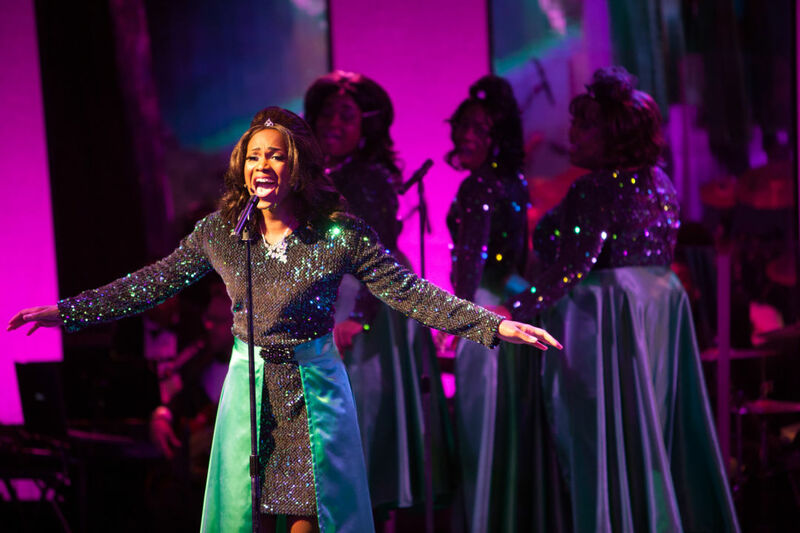 The cast of this new revue covers music from The Supremes, Martha and the Vandellas and more. Ariel Blue, JoAnna Ford, Khadija Sallet and Syreeta S. Banks in Girl Groups: The '60s Explosion. Westcoast Black Theatre Troupe and artistic director Nate Jacobs have had for some years a formula that works for them in presenting new musical revues. Take a cast of talented, hard-working singers, have them blend their voices on some baby-boomer-beloved ’60s songs, throw in some dance moves that reflect the spirit of the times, and voila—they have a hit on their hands. That seems to be the case with the current production, Girl Groups: The ’60s Explosion, which Jacobs concocted and directs and which is playing to sellout crowds. (There were a few empty seats the night I saw the show, but that was probably due to some last-minute changes of plan.) Once again, some familiar WBTT talents (Ariel Blue, Khadija Sallet, who played Dorothy in WBTT’s The Wiz) and some newer ones (JoAnna Ford and Syreeta S. Banks, who’s known for her work at other theaters here), take the stage equipped with period wigs, colorful costumes, Donald Frison choreography and outstanding backup by music director James E. Dodge II and his band to entertain the audience with songs they love and remember. 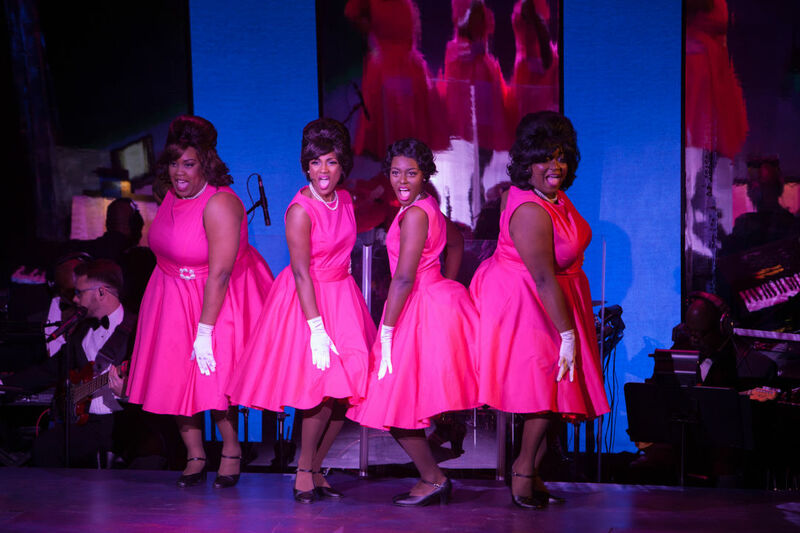 There’s a little bit of talk about the “girls” who sang in groups ranging from The Shirelles to The Ronettes to The Marvelettes and The Supremes and what they contributed to the music scene for an all too brief period, but mostly Jacobs and cast let the music tell the story. 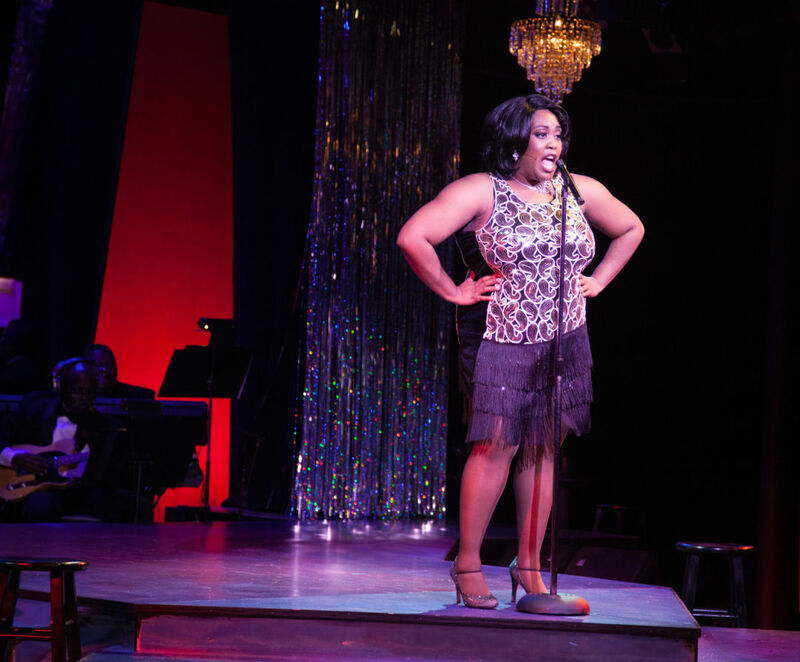 The performers can be demure (“Will You Still Love Me Tomorrow”), a bit silly (“The Wah Watusi”), fetching (“Beechwood 4-5789”) and, by the end of the show, a little raunchier, as the Tina Turner era is ushered in. Ariel Blue in Tina Turner mode. Ford gets to display her vocal talents as well as the lead on a couple of Supremes tunes, as does Sallet. The “older,” bigger-voiced singers, Banks and Blue, score, in Banks’s case, on the Bee Gees’ “To Love Somebody” and Turner’s “River Deep, Mountain High,” while Blue is an audience favorite delivering not only the music of Turner’s hit “Proud Mary” but some of Tina’s signature moves as well. It’s all pleasurable, if not exactly revelatory, but then you probably weren’t expecting the latter. Just enjoy the rock-solid work of the band and let the memories wash over you. Girl Groups: The ’60s Explosion runs through April 9, and though it is technically sold out, it can’t hurt to ask. Call 366-1505 or visit westcoastblacktheatre.org.